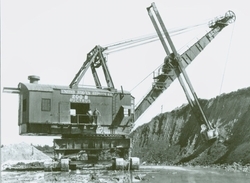 Historic footage of early Bucyrus-Erie shovels, draglines, scrapers, cranes, drills, dozers, Ruston-Bucyrus excavators and more! All copied from original Bucyrus-Erie archive films from the 1920s to the 1940s. Narration by HCEA National Director Keith Haddock. 2 hrs.